and in Slovakia at the Grand Hotel River Park and the Grand Hotel Kempinski High Tatras. The fragrant, all-natural and hand-blended MCELY BOUQUET cosmetics range is on sale at The Spa at Mandarin Oriental Prague. 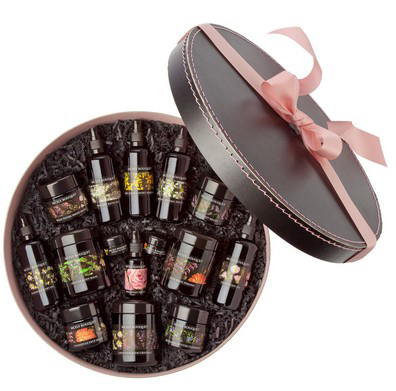 Inéz Cusumano, owner of Chateau Mcely and author of the pure nature cosmetics range, created aromatherapies, based on a MCELY BOUQUET products and the Czech Nine Flowers herbal tradition. "A Walk through a Flowery Meadow”, two-hour ritual, will thoroughly cleanse and care for the skin of your entire body, relax your muscles and soothe your mind. The second therapy is called “Lightness of Flowers for the Hands and Feet”. This is a two-hour ritual treatment of the hands and feet, including manicure and pedicure, based on traditional Czech herbal aromatherapy. It will provide you with a soothing feeling, gentle caresses and will encourage a light step. The aim of this new collection, which combines the principles of the healing Tatra nature, Czech and Slovak herbal traditions as well as the latest discoveries in the field of aromatherapy, is to provide guests with a unique, locally inspired spa experience. In particular, therapies and scents have been formulated to create the atmosphere and emotions of love, to provide relief from physical exertion after hiking and skiing, to provide release from mental strain, to open the airways, and to deeply nourish and hydrate the skin. Guests at the ZION SPA can enjoy these therapies: Mountains of Love, Pine and Lime, Tatra Aroma Massage, Juniper Tonic, Three Wells of Youth. Mountains of Love - creates an atmosphere of love and contentment. Pine and Lime - refreshes the air and encourages a good mood. Juniper Tonic – help you relax while dispersing negative thoughts. Cool Sauna - eases airways, in and out of the sauna. For a better night’s sleep, guests can try our special spelt-filled pillows with a few drops of one of our Tatra fragrances. Mother Nature endowed Bratislava with some truly valuable gifts. Located at the foot of the sun-warmed Low Carpathians and straddling both sides of the Danube River, it has fascinated multiple generations of poets and ordinary mortals. Hillsides dotted with vineyards and herbs, forests filled with the scent of pine needles, and walks along the Danube are all natural ways for the locals to relax. All these were inspiration for the founder of MCELY BOUQUET Inéz Cusumano to create a new collection of therapy experiences: “In the Embrace of the Low Carpathians”. The therapies aim to bring physical and emotional relief from the stress of the big city, rejuvenate the skin and soothe the soul. For achieving maximum effect, the therapies combine principles of vinotherapy and Czech and Slovak herbal tradition with the latest global knowledge in the field of aromatherapy. The following therapies were created for especially for Bratislava’s ZION SPA: Sizzling Riesling, Blue River Dream, Relief in Istropolis City, Danube Beauty. MCELY BOUQUET has also created new products for its range of pure natural skincare range for Bratislava. Body scrub with crushed grape seeds, grape sugar and oil, and a captivating sweet and spicy scent perfect for smooth, glowing skin. Induces good mood, counteracts stress and also acts as an insect repellent. Pumps up your self-confidence, enhances feelings of hope, confidence and love. The vanilla-eucalyptus fragrance creates an atmosphere of deep relaxation and peace and facilitates breathing.